Camorama,the latest upgrade App,indulges yourself in 360 vedio. Camorama App is a customized mobile application which is specialized designed for Camorama panoramic camera. Camorama App presents you with a panoramic view of the new world, enables everyone to own a panoramic view of the unique experience. 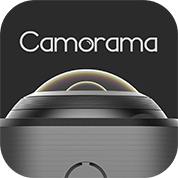 Camorama will become a part of everybody's fondest life.This app is designed for iOS9.0 or later version and Android5.0 or later version.